Muay Thai Battle Conquer Gym is a traditional Muay Thai gym sets amongst pretty farmland in the heart of Thailand, against a backdrop of glorious hills which allows you to have a better focus. A countryside retreat with 16 onsite rooms plus guesthouse and hotel accommodation gives this retreat its peaceful appeal and a more personal experience. 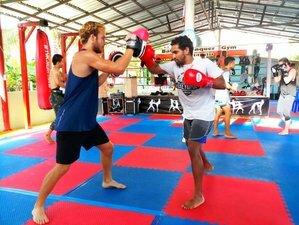 From unique Muay Thai training style where it includes elements of CrossFit and strength, to the Western Boxing training for overall fitness and fully custom meals, they have you covered. Keeping the camp numbers to a comfortable size to truly gives you the experience of being part of the family, living life the Thai way, soaking up Thai culture, and friendship. To maintain this high standard of training Muay Thai Battle Conquer Gym accepts a limited number of fighters at any one time to ensure students are getting enough attention to excel. You can expect to train as a group alongside your peers, they have found this the best way to train as it encourages motivation and builds relationships. That said, they have six full-time coaches, so you will have plenty of one on one time within the scheduled classes. Everyone looks forward to the Sunday rest day! There are many beautiful places to visit in Phetchabun, so on Sunday, Battle Conquer takes you to their favourites. It could be the stunning Nong Pye Lake, one of Phetchabun's largest set deep in the valley with beautiful panoramic views, take a raft out and relax, swim, fish, if you’d like refreshments, it’s not a problem, simply wave a flag and you can order the most delicious food and drinks delivered to your raft. Sapailo Temple is another lovely location for a trip out with it's pretty gardens and caves to explore or they may take you to the hot spring baths. Every Thursday and Frida, they have a meditation practice at the temple or lake. This Muay Thai training gym is located in Bueng Sam Phan, Phetchabun, Thailand. Bangkok is located 290 kilometers from the location. Daily breakfast and dinner are provided. Noi’s Cafe is only steps away from the training area. It makes fresh, healthy Thai food without added sugar or monosodium glutamate. Noi’s Cafe also makes delicious homemade ice cream for those who have earned a few extra calories. Craving a specific dish? Need more veggies, carbs, or protein? Just request it from Noi and she will not only make it, but make it tasty too!